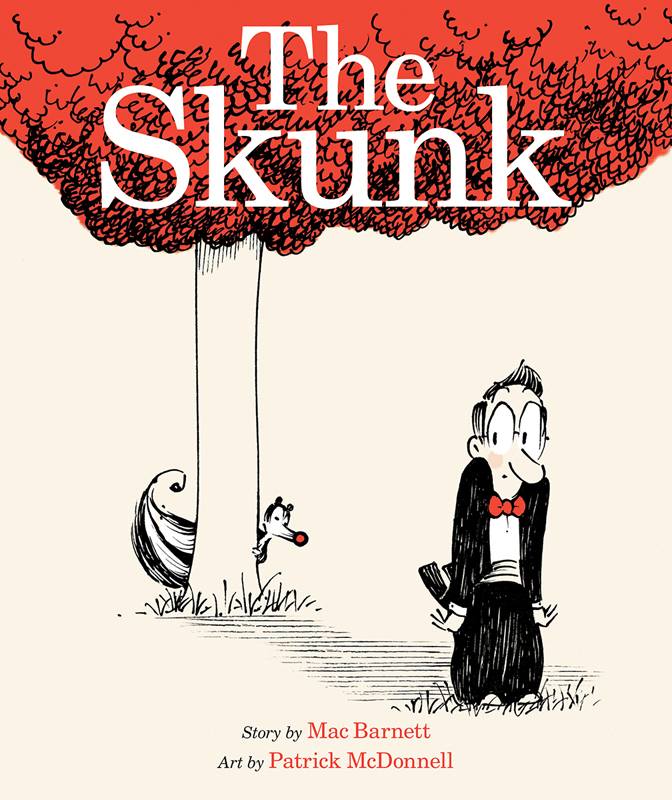 From the publisher: When a skunk first appears in the man's doorway, it's a strange but possibly harmless occurrence. But then the man finds the skunk following him, and the unlikely pair embark on an increasingly frantic chase through the city, from the streets to the opera house to the fairground. What does the skunk want? Soon the man has bought a new house in a new neighborhood to escape the creature's attention, only to find himself missing something. . . Many young Aussies will understand the ramifications of skunks, especially if they have older relatives who remember Pepe le Pew. When the un-named bespectacled and red bow-tied gentleman opens the door to a red-nosed skunk, he backs carefully and understandably down the street. But the skunk follows him. No matter what he tries to elude the skunk, the creature manages to find him, even appearing on a lady’s head at the opera. Finally the gentleman becomes skunk-free and begins to celebrate, only to realise he misses the skunk! I really enjoyed The Skunk. There’s an instant retro feel to this charming children’s picture book. Illustrations are cartoonish and minimal, many with a limited palette of black and white, and highlights of red. Only when the gentleman celebrates being free of his nemesis do we see yellow and blue appear. The narrative arc of the first half of the book reminds me of the twists and turns of the game Fortunately/Unfortunately. While younger kids will certainly enjoy it on face-value, I think children from older grades will appreciate its quirkiness and nuances too. So many unanswered questions. What does the skunk want? Why does the man miss the skunk? Older children will love using it as a model for their own imaginative stories. There’s a lot to learn about tension, point of view and particularly about satisfying resolutions in The Skunk. I hope you’ll share it with children who appreciate humour and great stories. The illustrations look awesome. Sounds like a cute premise to the book too!